NFL Fans Get Their Fill With 3 Games On Thanksgiving : The Two-Way The Philadelphia Eagles routed the Dallas Cowboys 33-10, the Seattle Seahawks beat the San Francisco 49ers 19-3 and the Detroit Lions won handily over the Chicago Bears 34-17. 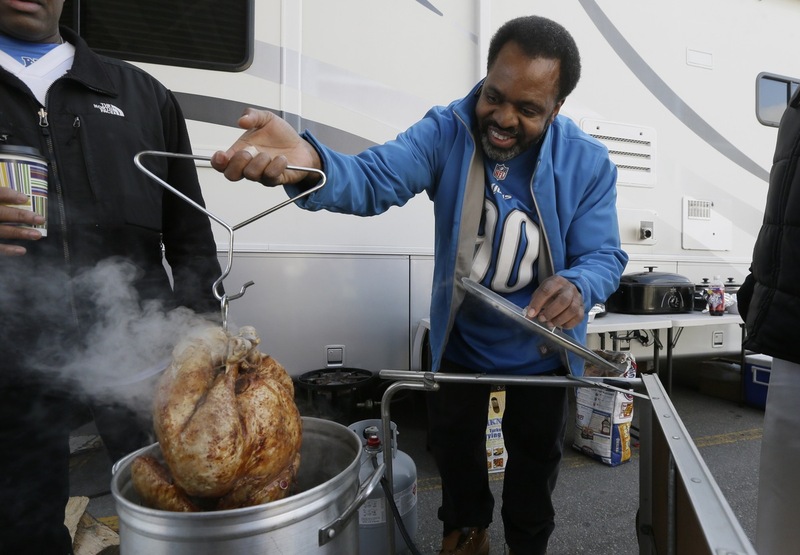 Jerry Dockery checks his frying turkey as he tailgates at Eastern Market before an NFL football game between the Detroit Lions and the Chicago Bears in Detroit on Thursday. The Detroit Lions won handily over the Chicago Bears 34-17. Detroit is now 8-4 for the season. The Philadelphia Eagles routed the Dallas Cowboys 33-10. The Eagles are now 9-3 and lead the NFC East by one game over the Cowboys. The Seattle Seahawks beat the San Francisco 49ers 19-3. Seattle is one game ahead of San Francisco for second place in the NFC West. There are three traditional Fs that highlight the Thanksgiving holiday: family, food and football. Today's three NFL games are each between division rivals, and all the teams are battling for a playoff spot. First up, while everyone is still wide awake, is a real Thanksgiving tradition: The Detroit Lions (7-4) host the Chicago Bears (5-6) in a classic match-up between historic NFL foes. Both teams are gunning for a playoff spot in the NFC North but neither is playing particularly good football this season. Today's game marks the 16th time those two teams have played on Thanksgiving Day since 1934. A Detroit win would even their series at eight wins a piece. The game starts at 12:30 p.m. ET on CBS. Dallas has played on Thanksgiving since 1966. The Cowboys (8-3) take on the Philadelphia Eagles (-8-3), and they're tied for first in the NFC East. A home game for the Cowboys doesn't necessarily make them a favorite. It's hard to pick any favorite when the league is as topsy-turvy as its been from week to week. This season, the Cowboys have been better on the road. The game starts at 4:30 p.m. ET on Fox. The prime-time match-up is between the last teams to represent the NFC in the Super Bowl — the defending champion Seattle Seahawks (7-4) and the San Francisco 49ers (7-4). The 49ers have had narrow wins over so-so teams this season but they've won their past three games. Last Sunday, the Seahawks had an impressive win over the Arizona Cardinals, which had the best record in the NFL. Both teams are two games behind Arizona in the NFC West. The game starts at 8:30 p.m. ET on NBC.